DREAM-POP ALERT!! Hurry was borne out of Matthew Scottolines creative urges six years ago, when his previous band began to slow to a halt. 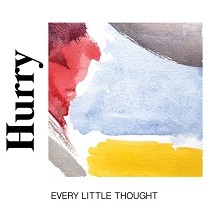 Adopting a more straightforward power-pop style, Hurrys first releases had a nostalgic, reverb-drenched 90s indie feel. Now comprised of a fixed line-up completed by cousins Joe and Rob DeCarolis, the bands fourth full-length sees Scottoline move away from walls of sound and more towards simple, breezy pop. His delivery is sweet  a smile and genuine affection for the songs is audible in his voice. They have become quite the force to be reckoned with. Their pop sensible songs are written from points of reflection, bringing a sense of questioning to their music. Theres so much to find in this world, whether it is love or how to capture a moment in time, and the trio capture just that on this record, one thats bound to be stuck in your head, filled to the brim with their charm.  NewNoiseMagazine.com Scottoline (admittedly) takes inspiration from Yo La Tengo and Guided By Voices  the title track from Every Little Thought perfectly captures that moment when college rock seeped its way into mainstream radio. But to these ears, the ringing guitars are straight out of Miracle Legion, with Gin Blossoms' listlessly heartbroken harmonies.  NPR.org The record sees the trio trim their music to its essentials, which results in their best material to date. The songs have nothing to hide because those who wrote them understand what makes this style click, demonstrating that one does not have to push boundaries in order to make a memorably compelling album.  RiffMagazine.com This is a pop-rock record in sound, scope, and appeal. There are still elements of their previous releases, the wall of sound appeal of the instrumentation, slightly distorted guitars, and reverb effects coming to mind, but the production value is stepped up here. The shimmery guitars come with a cleaner and crisper tone, working in conjunction with the hazy underpinnings of the songs. The vocals are more straightforward standing out in the mix and not filtered through distortion effects. It has Scottolines voice falling somewhere between Surfer Blood and early Drive-Thru Records power-pop band the Benjamins. Complementing the songs throughout are key flourishes, earworm melodies, and catchy guitar leads.  PunkNews.org GREAT! !